No, this does not mean that I was distracted while taking a picture! Rather, I was on my way home from a meeting and spotted a Great Blue Heron walking near the edge of the lakes not far from the house. I continued home and grabbed my camera and went straight back. The unfortunate part about trying to photograph birds is that most of them have fairly decent eye sight. There was not really anyway I could sneak up on the Heron. Luckily, there are a few different ponds/lakes in the area and it just flew to the next one over. This provided a little bit of an opportunity to get a little bit closer. The heron got spooked again after I took some photos of it walking around the edge of the pond. It then flew back to the first lake and I missed the takeoff and flight shots. 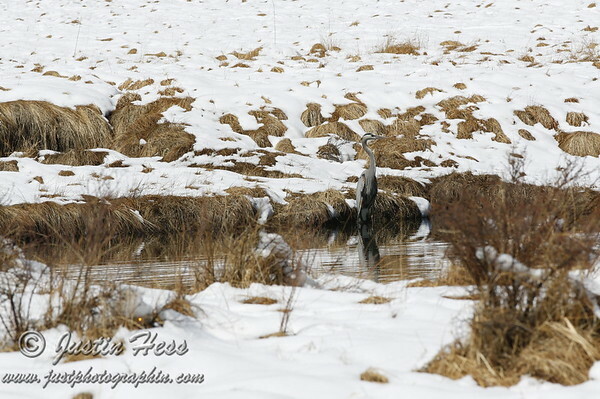 It was still a fun experience, and I am guessing that the heron will be around for awhile.